It wouldn't be right if I didn't dedicate today's recommendation to The New Edition Story. The mini-series that premiered January 24th, 25th and 26th a three night event chronicles the ups and downs of legendary music group New Edition from their humble beginnings in Boston to individual solo success and everything in between. 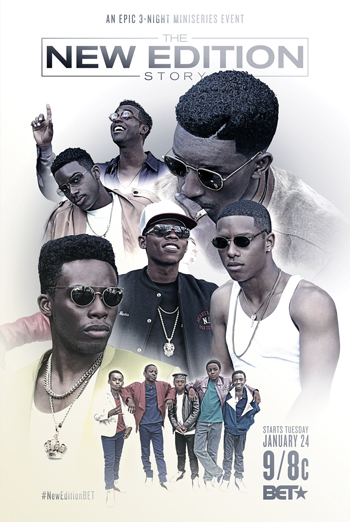 Starring Bryshere Gray, Elijah Kelley, Luke James, Algee Smith, Keith Powers, Woody McClain. YOUNG ACTORS: Jahi Di'Allo Winston, Tyler Marcel Williams, Dante Hoagland, Caleb McLaughlin, Myles Truitt. FUN FACT: This movie has been 10+ years in the making and I must say it has been worth the wait, everyone involved did a brilliant job. I can definitely put this movie in the category like 'The Temptations", "The Five Heartbeats". I, along with MILLIONS enjoyed this film. We learned a lot about the legendary group. Let's just say this one is on repeat as we speak. Check your local listings to catch the mini-series reruns.